The app still calls it "Zone" though? Reminds me of an old Wizard of Id cartoon where the King asks for a haircut. Whereas the barber says "I do not give haircuts but create hairstyles". The King replies "I create obituaries now give me a haircut." I guess I feel the same, I do not care what the process is called just the load the plane with out encouraging the gate lice. Exactly, call it whatever you want, the process is what it is. I flipped/scanned as much as much of this thread as possible, to seek the following question: what happens to the parents with strollers, wheelchair bound and other special needs people? I have occasional gait (walking) and other maladies from early Parkinsons. Didn't notice which tribe DL has put us with, I assume it's first to board.. I doesn't seem consistent but usually like this. You lumped yourself in with the stroller people, but that isn't the case anymore. Yes. That is what they have continued to do with the new boarding process. Just that families with infants and strollers are no longer part of that group. So just boarded FLL - ATL enroute to ORD. First travel since new boarding process. I get to the gate , look around and see no new pillars , basically just the old main plus sky at gate D9. Im a PM and chose exit since no upgrades were available on this leg, I have first confirmed on the next, but I cant remember the last time I flew below comfort plus. Boarding commences and they get to C+. I figure sky is next and get ready. The GA calls main 1 ! I hear a noise and rumble reminiscent of the buffalo scene in Dances with wolves, followed by main cabin stampede. 1 GA asked the other , did you call sky? I see her mouth , I called c+ sky is AFTER main.. Other GA seems to correct her, she shrugs it off. I finally make it to the scanner near the tail end of the stampede. I ask the the GA , the one with sense, did you call sky , does not that come before main? Her response "oh, sky and C+ board together. No use arguing with her at that point. They knew they screwed up and still chose to BS. As I walked down the jet bridge I can her them ask over comms if everyone in the line was main 1. Not sure what happened after that. Hopefully ATL is a better experience. Were you able to find an open seat? Write Delta -- only way they'll know. I actually haven't had too much issue with the new boarding process (though have cleared to C+ or F for all my flights since the change -- apart from one but that flight was a completely empty A319 where I took the full exit row over sharing a C+ row). Write Delta -- only way they'll know. 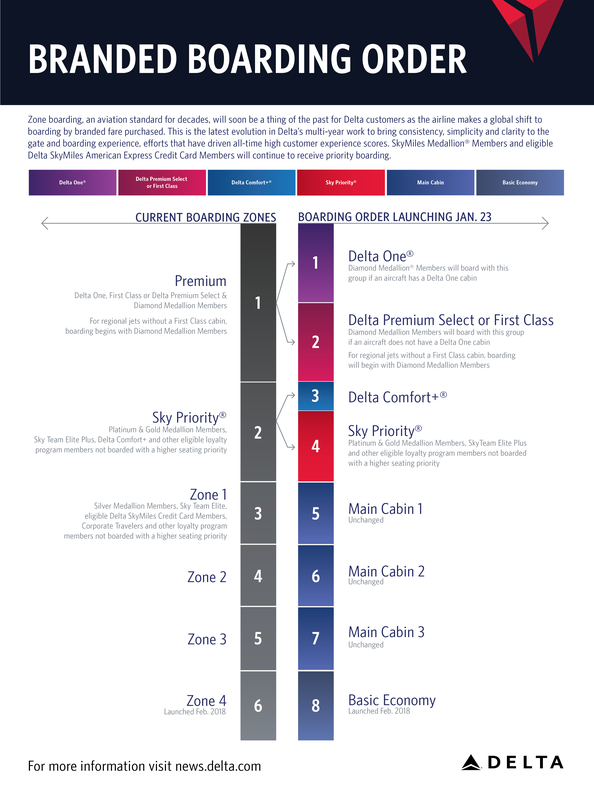 I would hesitate to submit a complaint with Delta for something rather petty. This stuff will sort itself out. I worry about being flagged as a "complainer" so only submit complaints when I really get screwed. Since I'm DM, I like the new boarding process, but I never see what shenanigans go on after I'm down the jetway. I disagree -- you can provide commentary with the caveat that you aren't looking for compensation (which I feel like is what typically leads you to be flagged as a "complainer") -- if no one tells them their GAs are not implementing the boarding zones properly, how will they know? My exit seat is confirmed so that was no issue. I'm glad there was still bin space. I normally get a survey so will use that outlet if offered. Sooooo... the app screwed me at ATL this time...I was at a bar and strolled on over 2 minutes before the app said boarding was to begin..I'm in F and when I got there C+ was just about done boarding. I missed the first round of PDBs...1st world problems I tell ya! For me, it was a short layover in Atlanta. Deplaned at D, boarding already started at B. I had a ticketed FC, and they were boarding Main Cabin. Line was pretty long. Do you cut in front of those folks and roll right up to the scanner, or do you slink back to the end of the line? I decided to catch my breath and wait at the end of the line, but wound up having to check my roller. Great question! I have wondered this myself. Not just is a higher zone (sorry not zone) allowed to jump the line, but do people actually do this? Absolutely! If logistics permit — i.e. you can get by pax to the SP/FC lane — I go up to the FC lane and present my BP. There has never been an issue and I think GAs expect such. This happens quite a bit with me, especially in ATL where I seem to have an awful lot of tight transfers. I go straight to/through the F lane and I don’t even get funny looks or pushback. If it’s at a crazy airport where pax are clogged, I’ll just take a seat and chill until I see the last pax or two getting swiped. Duke787 and defrosted like this. ...I had a ticketed FC, and they were boarding Main Cabin. Line was pretty long. Do you cut in front of those folks and roll right up to the scanner, or do you slink back to the end of the line? In that situation I use the SP lane and just wait until the GA calls me forward. There's no reason to stand in the general line, and as you found out despite being in F you can still lose out on OHB space if you board too late. daloosh and TheHorta like this. Is the wording "traveling with car seats and strollers" new? This early boarding group numbered about 50 PHX-DTW yesterday but (despite the clear announcement) included many families without car seats, strollers or for that matter children under 5. Another vote for enforcement.